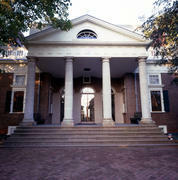 The Northeast Portico served (as it does today) as the house's primary entrance for visitors. The exterior face of the Great Clock, which shows only an hour hand, sits above the set of arched windows and door, and a compass rose in the portico's ceiling is connected to a weather vane above. Color Brick, rusticated facade and columns.